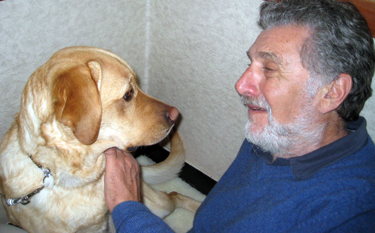 Emeritus Psychology Professor Elliot Aronson with his recently acquired guide dog "Desilu." Elliot Aronson, emeritus professor of psychology at UC Santa Cruz, has been named winner of the 2010 Constantine Panunzio Distinguished Emeriti Award. The award recognizes outstanding University of California professors in the humanities or social sciences for research and activities since retirement. Established in 1983, it is named for Constantine Panunzio, a sociology professor at UCLA, who is known as the architect of the UC Retirement System. It includes a $5,000 prize. Aronson, 79, the eminent social psychologist who retired in 1994, is the fifth UCSC professor to win and the third in consecutive years. Previous UC Santa Cruz winners are Hayden White, History of Consciousness, 2001; G. William Domhoff, sociology, 2007; Thomas Pettigrew, psychology, 2009; and Harry Berger Jr., literature, 2010. Only UCLA with six winners has more. Also winning for the 2010-11 academic year is J. Hillis Miller, distinguished professor of literature emeritus at UC Irvine. "The Panunzio Award is a great idea," Aronson said, "to recognize people for the work they have done after they retire; that is, after they stop working, officially! "It is a great honor to have been selected. For me, doing research on social psychological issues is not work--but a great joy. So, in a sense, I am being rewarded for having fun! Not bad." The UC Santa Cruz Emeriti Association nominated Aronson in recognition of his extensive teaching, research, and writing since retirement. Over the past 17 years, Aronson has published numerous articles and books, including the critically acclaimed Not by Chance Alone, My Life as a Social Psychologist (Basic Books, 2010) and Mistakes Were Made (but not by me) (Harcourt, 2007) with co-author Carol Tavris. He also wrote a children's book, The Adventures of Ruthie and a Little Boy Named Grandpa, with his then six-year-old granddaughter Ruth Aronson. UC Santa Cruz Chancellor George Blumenthal praised Aronson's selection, calling his work "brilliant, both before and after retirement." Blumenthal said he has long considered Mistakes Were Made (but not by me) "a handbook for chancellors." The Panunzio is the latest in a long list of accolades awarded Aronson. He received a lifetime achievement award from the Association for Psychological Science and was named one of the 100 most eminent psychologists of the 20th century in a study published in the Review of General Psychology. He won the first distinguished teaching award bestowed by the UC Santa Cruz Alumni Association. His contributions to the field of human behavior have explored the theory of cognitive dissonance and the causes of interpersonal attraction. His research always addressed important social problems, including prejudice reduction, energy conservation, and AIDS prevention. His textbook, The Social Animal, first published in 1972 and now in its 10th edition, remains among the most popular texts in social psychology. UCSC Emeriti Association president John Marcum wrote in the nomination letter that Aronson's scholarly work post-retirement "would be remarkable" for a sighted person; "for someone coping with the loss of his sight, it is hard to find a way to describe Elliot's success." Aronson has progressively lost his sight from macular degeneration. He continues to write and correspond using voice recognition software and recently acquired a guide dog, a yellow Labrador retriever named "Desilu." Aronson received his B.A. from Brandeis University in 1954, his M.A. from Wesleyan University in 1956, and his Ph.D. in psychology from Stanford University in 1959. He began teaching at Harvard University in 1959 and moved in 1962 to the University of Minnesota. He joined the University of Texas in 1965 and came to UCSC in 1974. After retirement he continued to teach for several years at UCSC and Stanford University.